Heat oven to 350°F (325°F for dark or nonstick pan). Make cake as directed on box for 13x9-inch pan. Cool 15 minutes; use fork or wooden skewer to poke holes all over top of cake, cleaning off end with paper towel as needed. Meanwhile, in 2-quart saucepan, heat 1 cup water to boiling. Remove from heat; stir in gelatin, wine and brandy until gelatin dissolves. Pour evenly over cake. Refrigerate 3 hours. In large bowl, beat whipping cream with electric mixer on high speed until soft peaks form. 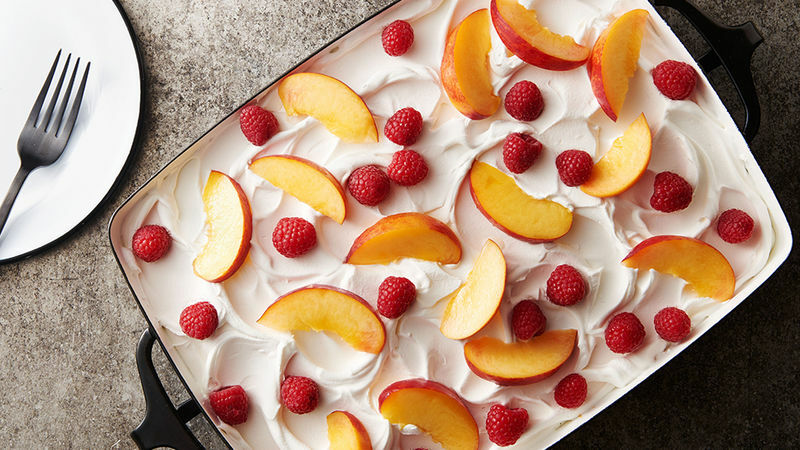 Frost cake with whipped cream; garnish with peaches and raspberries. If desired, swap whipped cream with 1 container (8 oz) whipped topping, thawed. If desired, swap brandy with calvados (apple brandy).